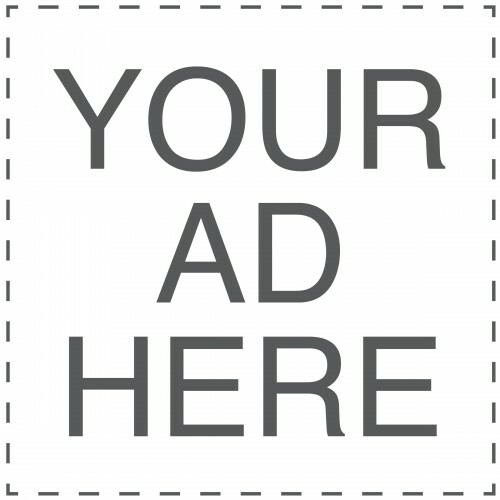 The 2014 NBA season will have a very unique feel because of the dichotomy of teams vying for a championship and others in sacrificial lamb mode looking for losses. The Boston Celtics entered full rebuild mode this off-season, shedding Paul Pierce, Kevin Garnett, and Doc Rivers while leaving Rajon Rondo to weather the storm. The other end of that trade is the Brooklyn Nets—a team still looking for the franchise’s first NBA title. Mikhail Prokhorov shelled out serious money to players that are not quite members of current NBA royalty. 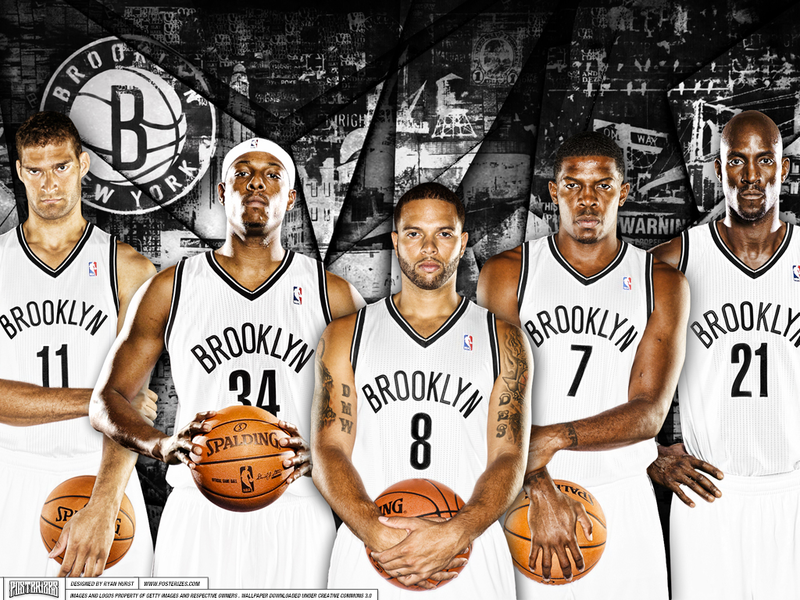 Put Jason Kidd at the helm and the Brooklyn Nets will be a fun team to watch. Here is my second annual NBA season preview and predictions. This is Part I in a three-part series broken down into the East preview, West preview, and playoff predictions. And after losing Josh Smith, the Atlanta Hawks will join three other “maybe next year” teams to give up big-name players (Celtics with KG and Pierce, Milwaukee with Monta and BJennings, and the 76ers with the corpse of Andrew Bynum). They will probably not lay down and tank the season, but they’re looking at missing the playoffs for the first time since 2007. While part of me wants the revamped Bobcats to make a playoff push, the truth is they’re the Bobcats…the punch-line of half of NBA jokes and memes. It won’t happen. I’m still not sure how the Pistons managed to do it, but Joe Dumars grabbed Brandon Jennings and Josh Smith in the off-season. For the first time since the Sheed-Billups-Tayshaun era, Detroit may have something to actually cheer for. The back-end of the East is particularly weak but in most-competitive scenario, it would be a Pistons vs. Hawks vs. Bobcats race. Even if that were the case, the Pistons have a deep frontline with J-Smoove, Andre Drummond (a 280-pound man child), and Greg Monroe. If Chauncey Billups can provide some veteran leadership for the young backcourt, Detroit will make the playoffs. And if the Pistons do land the 8 seed, someone please get the memo to Brandon Jennings that guaranteeing a first round victory against the No. 1 seed doesn’t work. Even if they are better than last year’s Milwaukee Bucks, they still have nothing on the Bulls/Heat/Pacers. With a full off-season for Rudy Gay to acclimate to Canada, I expect him to put up right around 20-6-3 and be the center of the Raptors offense. That’s still not quite what you want from a franchise-type player but Gay is the founder of the “not quite All-Star club” and still has to prove that he’s capable of making it to the next level. He and Monta Ellis have the unfortunate reputation of being the subtraction on addition-by-subtraction trades from their former teams (Gay with the Grizzlies and Monta with the Warriors). But unlike Monta in what was then Milwaukee, I think Gay has found himself in a good situation with appropriate supporting talent. With a knockdown shooter like Steve Novak and tough-nosed role players like Tyler Hansbrough, coach Dwyane Casey has the pieces for Toronto to be the new version of the Hawks of the late 00s. Andrew Bynum has to be the biggest wild card player in all of the NBA. He could come out and tear up the league…or he could destroy the hopes of a second franchise in as many years. At the top of his game, he is a nightly 20-10 threat but the argument could be made that right now, he’s better suited for the circus than the NBA hardwood. I’m a believer in Kyrie Irving as a franchise player, and it finally looks like he may have some pieces around him to sneak into the playoffs. Kyrie and Dion Waiters will be the foundation of the franchise and a more established version of what John Wall and Bradley Beal hope to be. 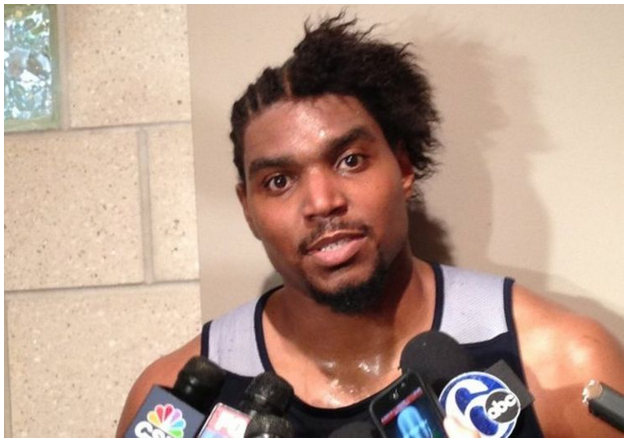 Even if Bynum proves to be a bad experiment, Anderson Varejao can be a Joakim Noah-type contributor. In December of last season, he had a five-game stretch where he hauled in 22, 18, 18,17, and 18 rebounds and put up nearly 20 points in each game on roughly 60 percent from the field. Glad to say he was on my fantasy team at the time. Flying under the radar is the Jarrett Jack pick-up. Even though I had a love/hate relationship with him when he was in Golden State, Samurai Jack was a critical piece in the Warriors 2013 playoff run. I expect him to provide a similar boost off the bench for the Cavaliers in a mix of minutes covering for Kyrie and possibly playing alongside him if the Cavs play small ball. Jack is cold-blooded and will take and make clutch shots even if he’s been on the bench for the first three quarters. After another disappointing one-and-done performance in the 2013 NBA playoffs, the road for Carmelo Anthony and the New York Knicks has only gotten harder. All four teams ahead of them in my predictions here have gotten better and while the Knicks have, too, it won’t be enough. Especially with distractions swirling around Melo leaving NY next off-season, I think the addition of Kenyon Martin, Andrea Bargnani, and MWP won’t be enough to get them any farther than last year. It won’t take you more than a Google search to find analysts who think the Nets have the ability to dethrone the Miami Heat in the East. As I have said, and will continue to preach, let’s wait and see. Remember the team that looked indomitable on paper last year and turned out to be the laughing stock of the NBA? There are quite a lot of similarities between those Lakers and these Nets: aging stars, owner spending on the best talent money can buy (not necessarily the best team), and an inexperienced head coach. If anything, Mike Brown had more experience than Kidd and had the benefit of being more than just a former opponent in the NBA to his players. The dynamic between J-Kidd and the older players on the Nets will be a storyline to follow in and of itself. For now, I think No. 4 is a reasonable spot to put them. They may battle the other New York team for this slot but I’m not ready to put Brooklyn with the East’s Big 3. With new Derrick Rose commercials already permeating national television, the hype for the former NBA MVP has just begun. Rose took a lot of heat last year for sitting out while his team did surprisingly well—and I was certainly a critic of Rose’s last year. But he can alleviate all of that with a strong return this year. Undoubtedly, Rose is one of the most electrifying players in the NBA—but like the case with Brooklyn, they still need time to gel and reach their full potential. And if Rose returns more like RGIII than Adrian Peterson from his ACL injury, it may be a disappointing return. Chicago will do well whether or not Rose is truly 100 percent, and they’ll be positioned nicely for a playoff run sitting just underneath the reigning Eastern conference finals teams. 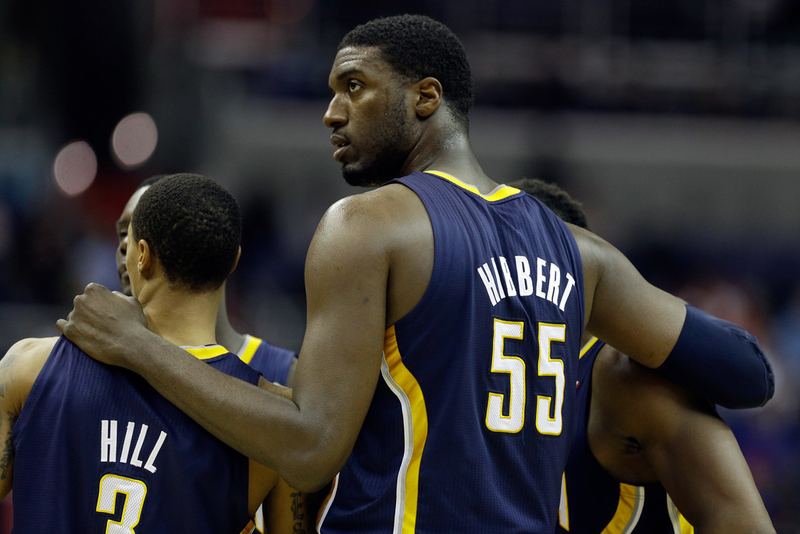 Outside of the Brooklyn Nets, the Indiana Pacers improved the most from last season to this. Getting Danny Granger back from injury will be critical because he can provide a serious boost to a team that was not very potent offensively (23rd in scoring) last season at 94.7 points per game. They also acquired a couple under-the-radar steals like Luis Scola and Chris Copeland...and another year of experience for Paul George will really help the emerging star. With Roy Hibbert and David West still manning the middle, I firmly believe that the Pacers have the most deep and well-rounded team in the East. But until I see reason to believe otherwise, they are still chasing the defending champions. Make no mistake about it, LeBron James is chasing NBA history this season. Looking to surpass Kobe Bryant with three NBA Finals MVPs is no insignificant feat. If he can pull off the trifecta again (regular season MVP, NBA champion, NBA Finals MVP), he will be a top-five player in history...and the man won't even be 30 years old!! What gets me the most about the Heat is that popular sentiment is that Dwyane Wade is on the decline. 1) These are probably the same people that say the Spurs won't make it...and we all know how the Spurs manage to do year after year. (Although it will be interesting to see how their management deals with TD and Ginobili's retirements in the coming years. Could it be a Celtics all-out tankfest or more like the Lakers struggling to maintain their stellar reputation?) 2) Nine players in the entire NBA scored 20 PPG last season and only three of those did that with over 50 percent shooting from the field. One of them was Dwyane Wade. 3) He's only 31 years old! We look at guys like Kevin Garnett and Kobe Bryant who are still performing at a high level farther along in their 30s and somehow Wade is the old guy? Finally, Wade is one of the toughest competitors in the NBA. Remember these commercials? He took a backseat to LeBron in order to win championships but that doesn't mean he somehow became a worse NBA player for it. Tack on Michael Beasley and Greg Oden to the Big 3 and you'll see that Pat Riley and the Miami front office craftily provided a couple players to fill out the roster and support two of the best players in the game. I may agree with you putting Miami first but I disagree with some of what you said in your paragraph explanation. D-Wade is difficult to compare to other big name guards (Kobe, Jordan come to find) who played well into their 30s because his game has always thrived on athleticism. Remember, Wade is a really, really bad 3-point shooter (ie: he attempted 4 the entire playoffs, and his career % is below 30), so he has to get to the basket and draw fouls, which gets a lot harder as your athleticism declines. Just take a look at his playoff stats - in 22 games, he scored 20+ points 5 times, while having 6 games with 10 points or less. That isn't great for a guy who is expected to be the second option, and definitely not one of the "best players in the game". Also, the additions of Beasley and Oden may prove successful, but there is a reason why nobody else signed those guys, and why they are minimum contract players - High-risk, high reward. While there is a change that they could both become solid contributors, there is an equal chance that Beasley gets arrested again and thrown out of the league and that Oden's knees just can't handle the NBA, as they haven't in the past. That's why these guys are getting paid tiny salaries. So, at the end of the day, if Miami repeats as the #1 seed in the east (and possibly as defending champs), I think it will be due to one man - LeBron James. He is the best player in the NBA today, and I see no reason for him to slow down. The playoffs become far more difficult when you are the lone superstar (Indiana and SA took Miami to 7 games, as you remember), but in the regular season, Miami should get the #1 seed due to the greatness of LeBron. I didn't just compare Wade to other big name guards, though. I also mentioned KG - an athletic big man who you may not think would last as long as he did. I also mentioned it in a previous article somewhere, but Wade is great about playing to his strengths. So, yes, those strengths are quite reliant on athleticism, but don't forget he can also work the post game, etc. And who is to say he doesn't develop a 3pt shot? There are players with less talent than Wade that developed their games even late into their career. J-Kidd and his three-point shot comes to mind in that sense. And wait...do my eyes deceive me...are you suggesting that by saying you "see no reason for him to slow down" that he will win the 2014 NBA championship? Big men do tend to last later into their careers - Shaq, Timmy D, Kareem, Hakeem, etc. Also, Garnett can shoot Js like nobody's business, and he's a solid defender. Admittedly Jason Kidd isn't a bad example, but he became a role player who is barely guarded by the time he developed it. I just don't see wade developing that shot, and I think his performance in the playoffs is likely to be repeated through this season. And nope, I'm not! Notice, I said "regular season" :). 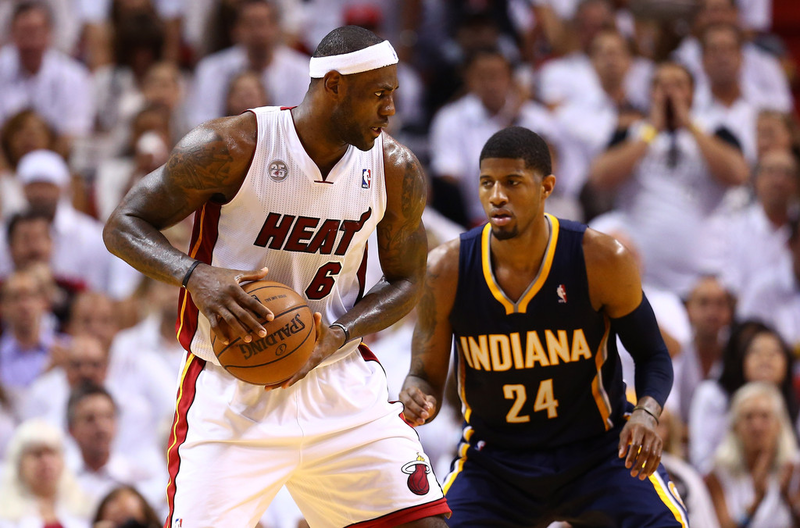 In the playoffs, when the game slows down, I think a great defensive team such as Indiana can slow down LeBron just enough to sneak into the finals. Remember, they took them to game 7! And they got Granger back (offense! ), added some solid role players, and PG-13 is improving every year. So I think they could dethrone the Heat. Also, Brooklyn is a wild card that could end up VERY good. I agree it is a bit difficult to see Wade developing a solid outside shot but if he puts in the work in the off-season I think it could happen. The post I just put up on the Bases and Baskets Facebook page (https://www.facebook.com/photo.php?fbid=646538782043871&set=a.456655917698826.110535.408713472493071&type=1) could provide another spark for DWade. To be perfectly honest, I see a lot of similarities in the shot between Kobe Bean and D-Wade - a flat, low-liner. That's not to say that Wade is the jump shooter that Kobe is, just to say that there is a possibility even with his somewhat quirky shot mechanics. If LeBron can learn to shoot threes, anyone can.... Haha. Ohh okay just had to make sure. As for Brooklyn, yup, I gave them their own "group" as the Big Wild Card because they are just that.